Copyright© Mosley Electronics, Inc. / mosleyelectronics.com All Rights Reserved. M.E.I. 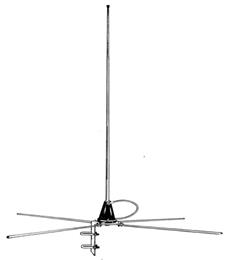 A 5/8 wave omni-directional vertically polarized 2 meter antenna with a low angle of radiation ideal for base-to-mobile operation. Features the Mosley "Induct-O-Match" system for loading and impedance matching and a female coax connector that is easily fastened to the radial support for a long lasting connection. Business Band transmitting and receiving are possible on your own assigned frequency in this range. The Diplomat 2 is ideal for anyone having a need for 2 meter base-to-base or base-to-mobile communications. 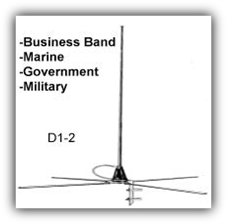 The ULBB Uni-Linear Vertical ground plane antenna, the DP-275 Dispatcher, is a vertical ground plane antenna with an exceptionally low angle of radiation. It incorporates a shunt match feed with 50 ohm impedance rated to 1,000 watts and a nominal 1.5 or less VSWR at the resonant frequency. 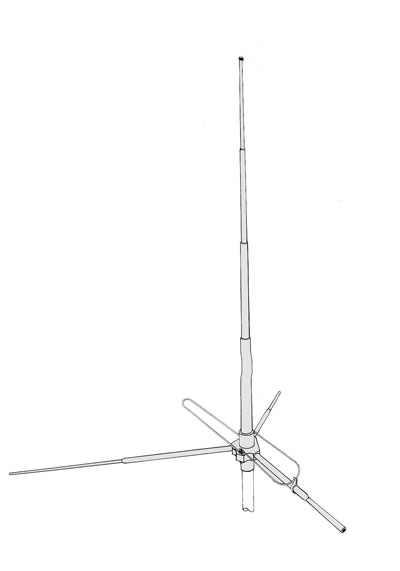 The Mosley "DP-275" offers a 3.4 gain over a standard ground plane antenna. This antenna is grounded for lightning protection which also reduces rain and snow static. 6063-T832 aluminum alloy tubing with high tensile strength makes this antenna the durable antenna desired for commercial use. The vertical element of this DP-275 telescopes into a wrapped phenolic base tube which has a greater strength than the aluminum element. Radials (horizontal elements) terminate into a high strength "ABS" base which has again, more strength than the aluminum element. Antenna mounting is simplified: just mount the antenna on a mast, tighten two screws, and lock nuts. All hardware is of stainless steel or steel-plated to meet government specifications. This vertical ground plane has swaged (tapering ends of aluminum tubing) designed to reduce wind load and any possibility of vibrations which could cause metal fatigue. Customize-It-Yourself - a feature of the antenna that permits you to monitor the action of the 21st Century. This remarkable 2 meter antenna may be easily cut to any desired frequency between 150 and 175 MHz. Simple, concise instructions are supplied with the Diplomat 2. Now you can tune into the police and the fire department, industrial, emergency net, utility, forestry, marine traffic communications, and many more interesting, useful, and informative broadcasts available on 150 through 175 MHz. Dispatcher Series, 5/8 wave ground plane, 11 meter "Devant Special"